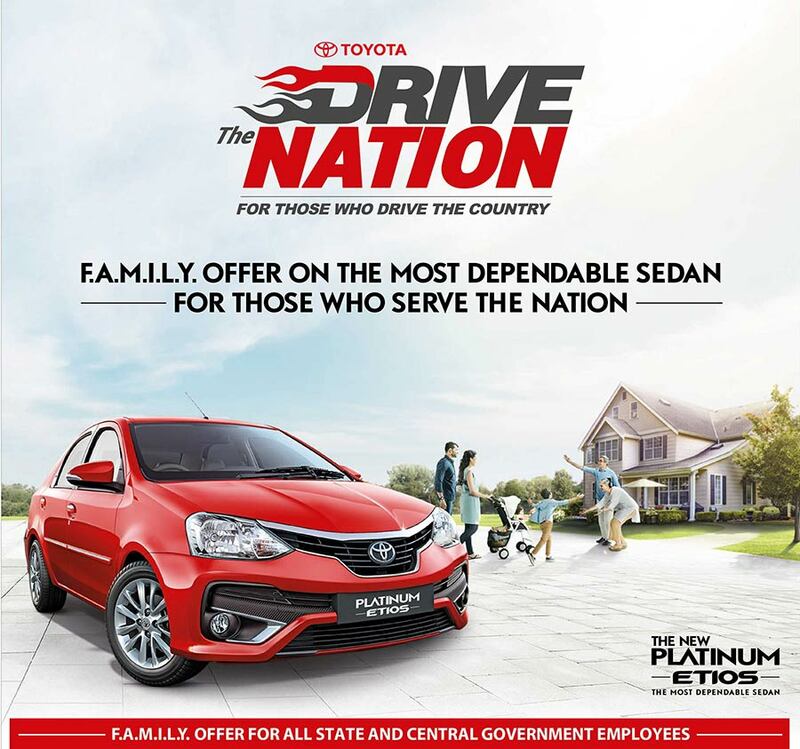 Toyota Kirloskar Motor (TKM) announced its special initiative “Drive the Nation” exclusively designed for India’s Central and State government employees and defense personnel (current and retired). The campaign which is applicable from September to December 2016, is a “one-stop-shop” of integrated offers to car buyers under the purview of the new initiative. Launched inline with the recent 7th Pay Commission for Central Government Employees on pay and pensionary benefits, the new “Drive the Nation” campaign is an attempt to extend our gratitude to the services by defense personnel and Government employees nationwide. The initiative that is applicable only on the Etios series, will offer a gamut of benefits starting from affordable funding solutions focused on low customer acquisition cost, attractive offers on Toyota Protect Insurance and Toyota Genuine Accessories, maintenance package and unmatched extended warranty. A – Service Value Maintenance Pack – Save 25%* on Maintenance Cost. M – Special 10% discount on Premium TGA Package. L – Exchange/Loyalty – 10,000 Rs/- Loyalty Bonus or Attractive Exchange Benefits thru U-Trust Dealers. Y – Extended Warranty – Avail up to 5 Years / 180,000 km*. We are delighted to launch this special program for the central and state government employees aligned with the implementation of 7th Pay Commission. The 7th Pay Commission will be a positive boost for auto industry owing to the rise in income levels and spending capacity. It comes at the right time when we have launched our New Platinum Etios & Etios Liva to largely attract personal customers with enhanced comfort features pushing the boundaries of traveling experiences. ‘Safety first’ is clearly visible in the Etios series. Etios is the first in the industry to have standardized dual airbags and Anti-Lock Braking System (ABS) with Electronic Brake-force Distribution (EBD) across all grades. Customers can leverage from the ‘Drive the Nation’ initiative and maximize their purchase when they buy New Etios & Liva. It is TKM’s endeavor to continuously improve products and services to keep pace with changing customer needs in the market. “Drive the Nation” campaign is one such initiative to honor the contributions of defense personnel and Government employees towards country’s growth by offering wide range of value added services. The Etios series caters to the needs of a typical family car. Specially designed for the discerning Indian customers, the car offers the highest safety standards, impressive fuel efficiency and spacious interiors ensuring great comfort and trusted dependability which are the most sought after features by a modern Indian family. The Etios Series, consisting of Etios, Liva and Cross, is strongly backed by Toyota’s Global Promise of Quality, Durability & Reliability. Launched in 2010, the Etios was produced to meet unique requirement of Indian customer of high cabin and luggage space, high fuel economy and lowest ownership cost. Earlier this month, the company launched “The New Platinum Etios and New Etios Liva” with bold new design, unbeatable safety features and unmatched performance. With this launch, Toyota became the first in the industry to standardize Anti-Lock Braking System (ABS) with Electronic Brake-force Distribution (EBD) across all Toyota models & in all grades. With its superior styling and added premium-ness the new launch caters to the evolving customer needs of the personal segment. Toyota Kirloskar Motor known for its safety emphasis has constantly worked towards developing better technology to provide enhanced safety. Testament to its position as one of the segment leaders in terms of passenger safety, the Etios was presented with the coveted 4 Stars in Global NCAP Crash Test adult occupant safety for the year 2016.